With the end of the old year and the dawn of the new year, I’m sure you’ve seen your fair share of “Year in Review” posts floating through your Facebook newsfeeds. Some people argue that things such as this have replaced scrapbooking layouts and albums. This is the new scrapbooking, they say. We no longer turn pages; we scroll them. So why then do some of us continue to use paper to preserve our memories? Is scrapbooking with paper still important? Well, let me tell you what I think. The things that pop up in our newsfeeds often become irrelevant within mere hours of being born. Their permanence is as fleeting as dust in the wind. People will click through maybe once or twice, but after that, few will even remember they were there. When we upload pictures to Facebook, it fails to leave us with the same sense of satisfaction that comes from the whiz of a paper cutter or the stickiness of fingers spotted with adhesives. And when we type out our words, we lose the intimacy of handwriting and the beautiful way a personality dances its way through the shapes of the letters. This is why I love National Papercrafting Month. It’s a wonderful reminder at the beginning of the year of why I fell in love with scrapbooking in the first place. It reminds me why we still spend time preserving memories with paper in a world that is slowly turning into pixels. Working with paper will ground you in reality and in the beautiful subtleties of our physical world, which is why I think the Year >> Noted kit is so nicely suited to this month. In the rush of a new year and the memory of an old year, it not only keeps me grounded, but also gives me a place to tether my dreams, making my big goals seem so much more in reach! Life is a continual cycling of beginnings and endings—don’t get lost in the whirlpool. Take the time to write down those things within your heart that will one day become the whispers of your past. Ground yourself in paper. Because when you hold a real, finished project in your hands, the rush and the hurry fades away and the only thing you feel is contentment. And trust me, when this new year becomes old and the time comes to reflect, you’ll be happy you have something real to hold and to remember. Let this kit become a time capsule filled with little pieces of who you are in this moment. I promise you that when you take the time to remember, your heart will fill with gratitude for not only who you are, but also for who you are becoming. 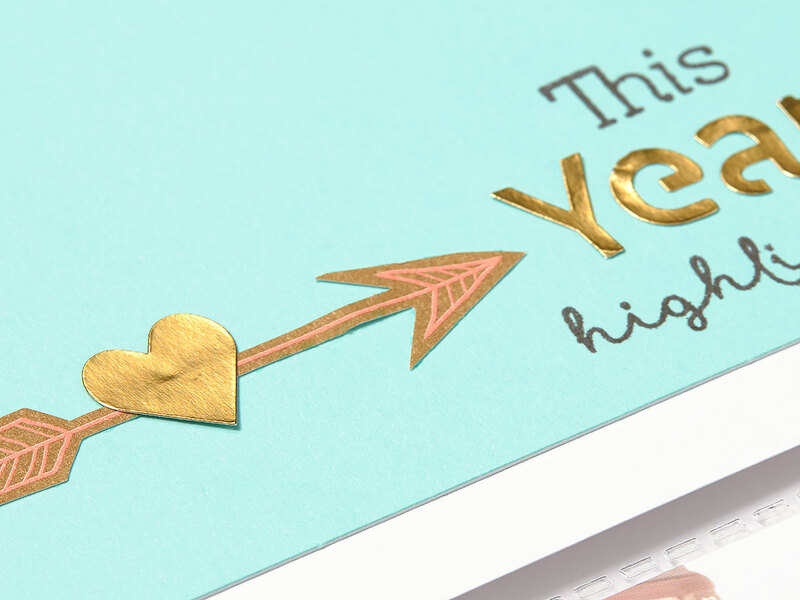 We know you’ve raved over the spunky B&T paper and the exclusive pastel cardstock pieces of the Year >> Noted paper kit, but have you noticed the kit’s amazing stamp set? As the most expressive part of the kit, it’s worth seeing again and again on your projects. This set is just the right tool for creating perfect captions, journaling spots, titles, headlines, and dates on your scrapbook pages. Its fun sentiments can become the inspiration for your journaling and even what photos you choose to display. They work seamlessly with the other pieces of the kit–especially the golden foil stickers—to help you note the moments that matter most. 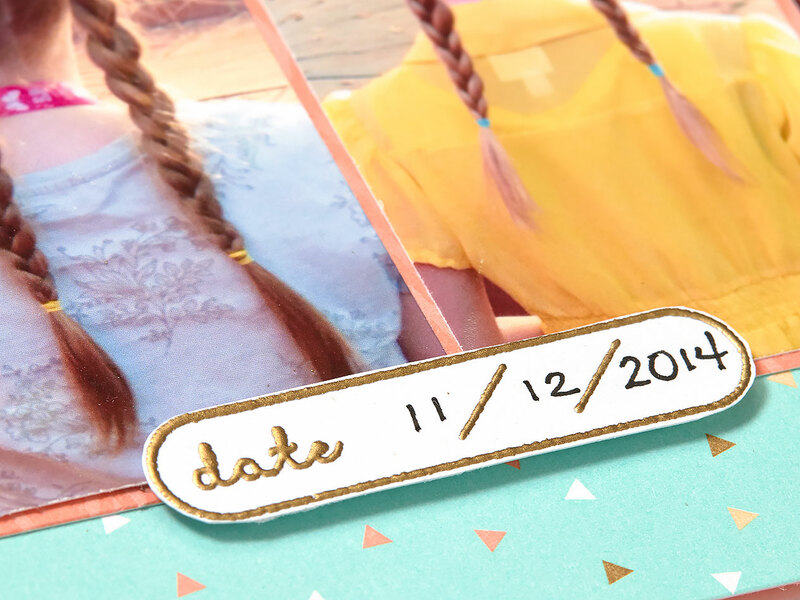 This date stamp is a definite must-have for a scrapbooker. 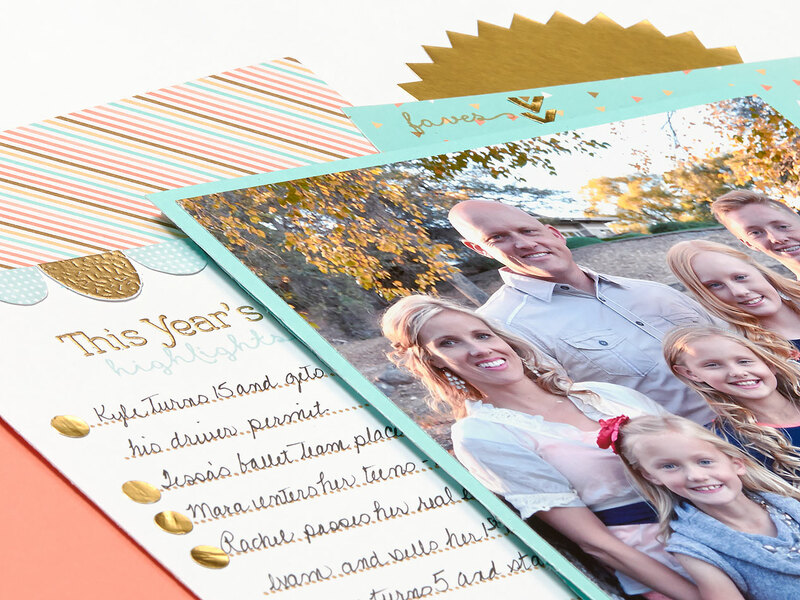 We’ve given it extra glam here with our Ranger™ Princess Gold embossing powder. The look matches the fun golden foil stickers that come with the kit so well you can hardly tell they aren’t the same material. On this more traditional scrapbook page, the artist has taken the stamping up a notch with embossing to match it to the shimmer of the golden foil stickers again. Ooooh, shiny! 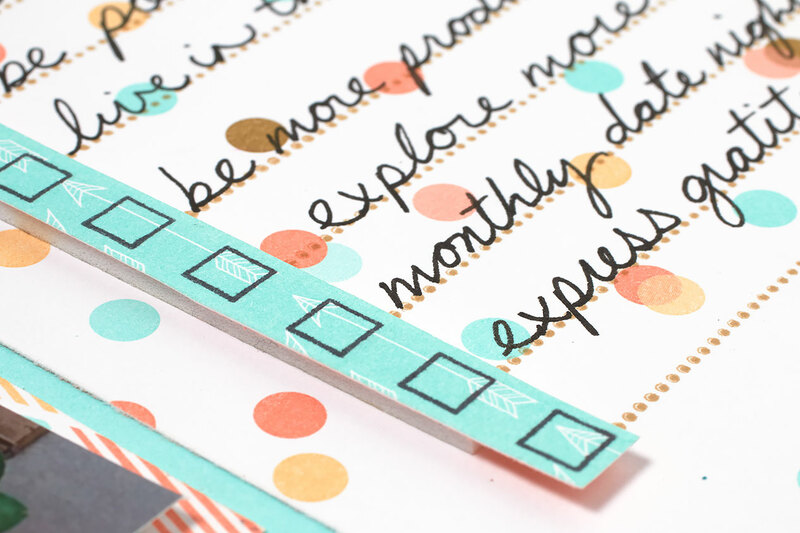 Check out the versatility of the dotted line stamps in this set. 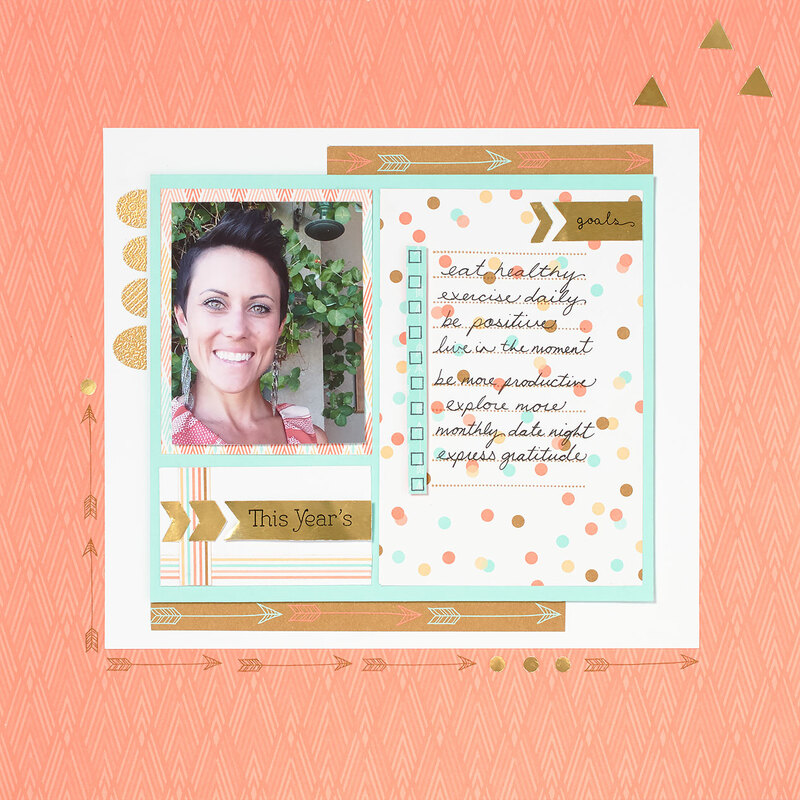 The image stamped across the bottom and middle of the page makes an understated border, while you’ve also got an image ideal for creating journaling lines. 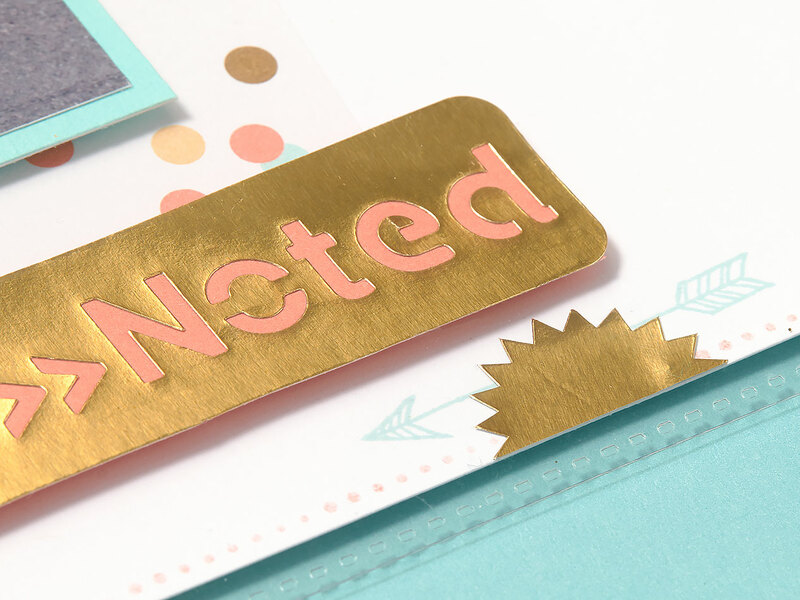 Top off your journaling with a few fancy bullet points made from golden foil stickers. Or, if you like a checkbox look, stamp a few the way you see them done on this page. There’s that true arrow stamp! Told ya it was cute. A classic stamp image works great whether it is in the spotlight or playing a more subtle role as an accent. 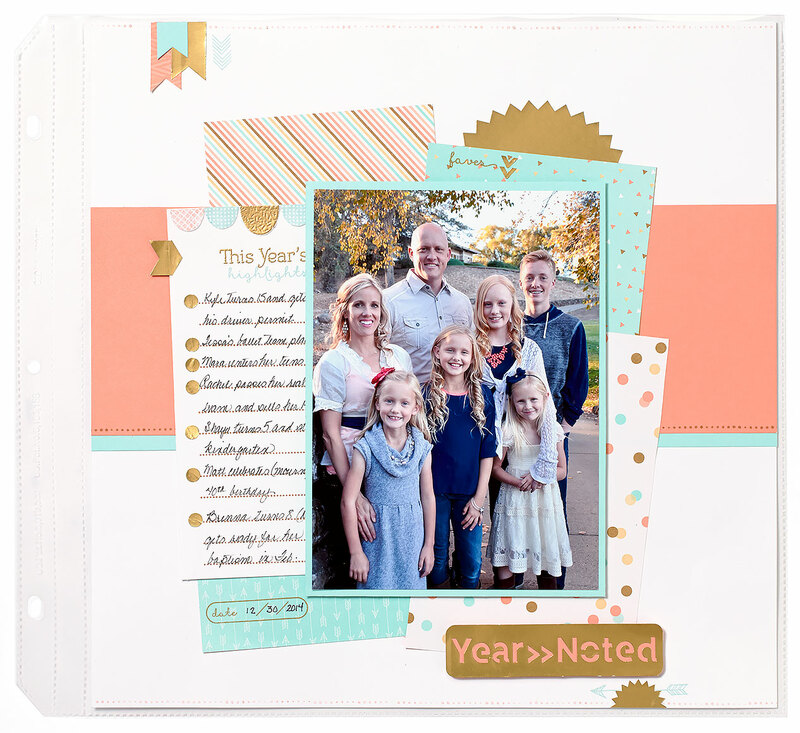 The clustering of the B&T trimmed cards makes a great backdrop for your photos, and stamping your favorite sentiments on them ties the whole page together nicely. Year >> Noted is available for a few weeks yet. Get your cute stamp set (we’ll throw in the paper kit too) before the end of January! 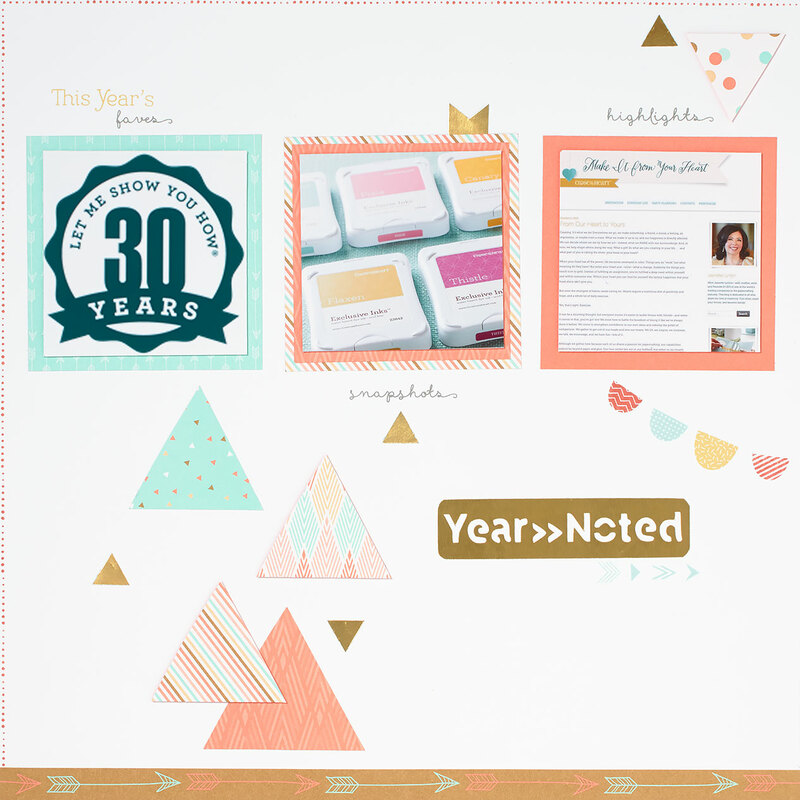 For a chance to win a FREE Year >> Noted paper kit for yourself, share a comment below telling us about a milestone event that occurred in your life in 2014 or an event that you are looking forward to in 2015 that you plan to include in a Year >> Noted mini book or layout. Fifteen random winners will be announced next week! Mini book + paper kit = a match made in heaven! Additionally, the kit papers, stickers, and stamps lend themselves to all kinds of other projects. 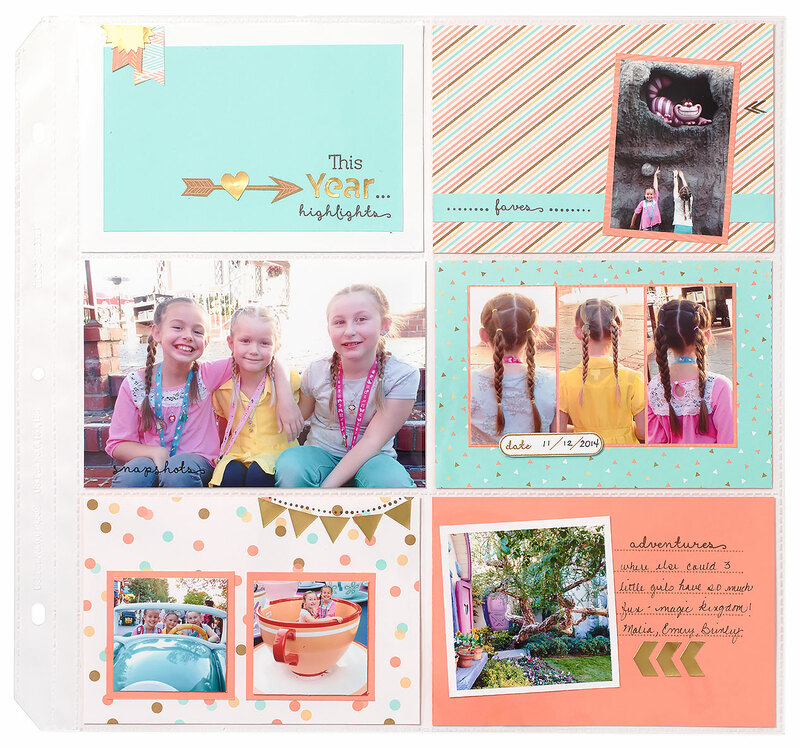 We think you’ll find yourself feeling especially swoony over the coordinated look of the scrapbook pages you can make with this kit. The designed 12″ x 12″ B&T papers can be trimmed into “cards” to use on your layouts, as you see above, or they can stand as beautiful 12″ x 12″ page bases all on their own. Better yet, try mixing the two for a delightful combination! The papers aren’t the only gem in the kit; you’ll go crazy over the stamp set, too! Even more than just being absolutely adorable, it’s extremely helpful in documenting memories. We love the journaling lines stamp for its utility—and its perfect coordination with the dot border stamp makes it even better. The sentiments of the set are perfectly suited to projects that focus on the best kinds of moments in your life. Stamped phrases like “faves,” “snapshots,” “highlights,” “adventures,” “goals,” and “accomplishments” can help kick-start your journaling and guide your photo selections. To top off the kit, the golden foil stickers come ready to rock and roll—they’re super trendy and complement the B&T beautifully. Try clustering several stickers with some similarly shaped B&T triangles, like you see here. The golden foil stickers in the kit come in a variety of cute shapes and sizes, and they’re even great for stamping on. That’s right, folks, you can stamp on them! 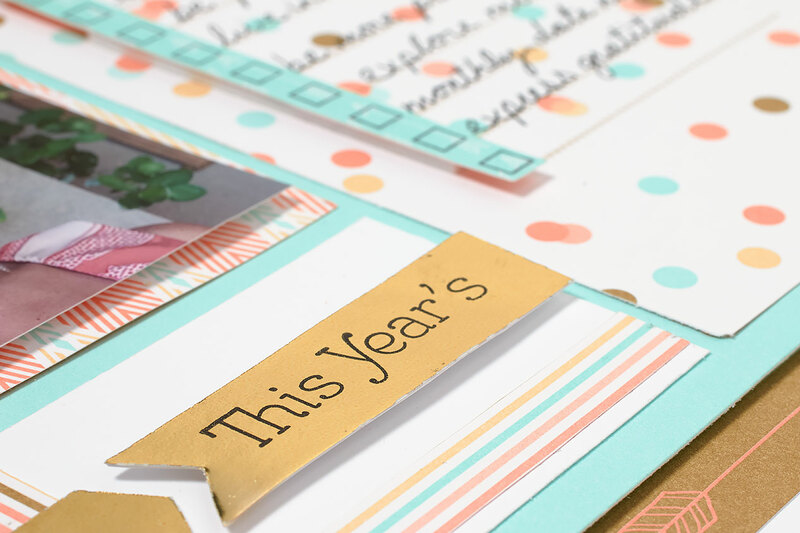 The Year >> Noted paper kit is popping with addictive colors and patterns—it will have you plugging in memories right and left. Let’s make 2015 your best-documented year yet!